NEW YORK CITY, August 12, 2015 – The second annual GFNY Italia bike race is scheduled for September 20, 2015 in Terracina, Italy. Riders from over 30 countries will tackle the 78-mile long course with 6,230 ft of climbing or the 65-mile medium course with 5,426 ft of climbing. 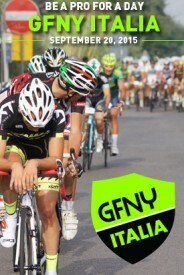 GFNY Italia was the first event based on Gran Fondo New York, the inaugural edition was held in September 2014. GFNY founders Lidia and Uli Fluhme wanted to provide riders from around the globe the chance to experience a granfondo in Italy. At a GFNY event, riders get to compete against each other, the clock and themselves in a personal endurance challenge. This follows the model of a true Italian granfondo. The Italian sponsors at Gran Fondo New York decided to support the Italian project despite having hundreds of other events in Italy they could liase with instead. It shows their appreciation for bringing Italian cycling culture abroad and their desire to be attached to a race with the GFNY name in their home country. At this year’s GFNY Italia, Cicli De Rosa equips the winners with their high end, custom Protos GFNY frames. New York title sponsor Campagnolo got on board by offering all finishers a GFNY Italia cycling cap. 2014 GFNY Italia title sponsor Limar continues to be one of the series biggest supporters with their Ultralight+ GFNY helmets. Limar is also present at GFNY Cozumel, GFNY Argentina and GFNY Mont Ventoux. Biemme is once again the supplier of the official GFNY Italia kit. Riders who sign up for the 99 Euro VIP option receive a jersey that allows them to start in the front corral. Storied saddle manufacturer Selle San Marco provides the official GFNY saddle – 100% hand made in Italy. New in the GFNY landscape as a sponsor is Schmolke Carbon from Germany. Schmolke has been producing the lightest handlebar for over two decades. The company’s founder, Stefan Schmolke, started experimenting with carbon layers, baking the product in his home kitchen oven. Schmolke quickly became the secret supplier of the world’s top cyclists. While no longer baked in his home oven at Lake Constance in Germany, the company’s handlebars are still world’s lightest. The 6th annual Campagnolo Gran Fondo New York on May 15, 2016 will be the second GFNY Championship. The race features the world’s most international peloton with riders from over 70 countries. Athletes take on a challenging 100-mile route from NYC to Bear Mountain and back to compete against each other, the clock and themselves in a personal endurance challenge. GFNY WORLD now features events in Italy, Mexico-Cozumel, Argentina, Colombia and at Mont Ventoux/France. Riders there have a chance to qualify for the elite racer corral at the GFNY Championship in NYC by placing in the top 10% of their age group.